The history of eugenics actually goes back much further in history; apparently Plato advocated selective breeding of humans. Eugenicists advocate for higher rates of reproduction among people with desired traits and reduced rates or even sterilization of people with undesired traits. Galton was the first person to study human variation in a systematic way. He observed that upper-class people tend to marry later and have smaller families, and suggested that eminent people be given incentives to have more children. He was concerned that small family size amongst the cognoscenti, along with poor people having lots of children, would cause a decrease in people’s mental ability. average intelligence is not decreasing significantly in the USA and actually may be increasing. This is a strike against eugenics. In Germany the eugenic movement started in the late 19th century but didn’t become strong until 1927, when the Kaiser Wilhelm Institute of Anthropology, Human Heredity and Eugenics was founded. One if its early directors, Eugen Fischer, wrote a long treatise titled “Principles of Human Heredity and Race Hygiene”. Hitler read and was inspired by this treatise. 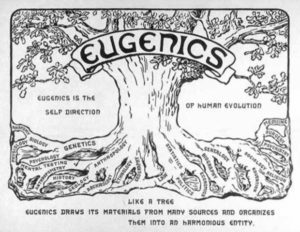 In 1933, when the Nazis came into power, it became illegal to oppose eugenics and the “Law for the Prevention of Hereditarily Diseased Offspring” was passed. It established “eugenic courts” throughout Germany. Doctors were required to report “inferior” people (including people with retardation or mental illness, hereditary blindness or deafness, or other hereditary diseases). Cases were then presented to genetic courts, which would decide if the people should be sterilized without their consent. Hundreds of thousands of people were kept from having children because of this law. As time went on, elimination of “undesirables” by sterilization was not sufficient. From 1939 to 1945 people with birth defects or in psychiatric hospitals were murdered by order of the Nazis. These murders were in addition to millions who were killed because of their ethnic heritage, religious beliefs or sexual orientation. German history illustrated the worst of eugenics, but the USA was not immune from tromping on reproductive rights. Carrie Buck was a case in point. She was a young woman who was able to read and write. Nevertheless Carrie was labeled “feeble-minded of the lowest grade, moron class” when admitted to the Virginia State Colony for Epileptics and Feebleminded in 1924. Three years later her tubes were tied, even though she wanted more children. This was not an isolated case of a woman getting sterilized against her will; it was condoned by the Supreme Court of the United States. Ms. Buck was a test case brought to the Supreme Court to support eugenic sterilization. It appears that a “guinea pig” was needed and Buck was chosen because she was poor and had had a child out of wedlock (after being raped), despite being of normal intelligence. Unfortunately, Carrie Buck was one of thousands of American women and men who were sterilized in the past without their consent. For instance, records from California institutions show that 20,000 people were approved for sterilization in the first half of the 20th century. The vast majority of these victims had Spanish surnames, reflecting the prejudices of the era. More recently 39 women in California prisons were sterilized without consent between 2005 and 2013. Retarded people, people of color and prisoners still have human rights, don’t they? Fortunately, laws that govern sterilization procedures are strict now as a reaction to the abuses that took place in this country. The person must be at least 21 years of age and must sign a special consent at least 30 days before the procedure. This is onerous in a way, because it means that some people who truly want to end their ability to reproduce miss out. You are currently browsing the archives for the Bad ways to slow population growth category.